You can use the ^ operator to do a bitwise exclusive OR (“XOR”) operation between two integer-based values. 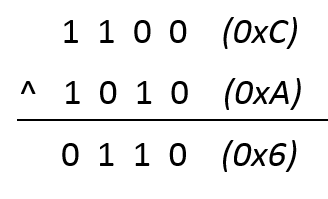 An exclusive OR operation is applied to two different bits, returning true if exactly one of the input bits is true. Here is a truth table showing the output value for all possible input combinations. You can use the ^ operator on two arbitrary integer values as shown below. The operation is applied to the two integer values, one bit at a time. It may help to use hex notation in order to better understand how the exclusive OR operation works on each bit.